We love them in cakes, dumplings or just raw. You can gather them on your own and they have extraordinary wholesome effects. Blueberries belong to the healthiest fruits on the Earth and we will show you how to prepare a tasty drink from them! Blueberries and berry fruits in general contain a huge amount of antioxidants, which have almost magical effects on our organisms. Thanks to their ability to fight free radicals and other harmful substances blueberries help to prevent serious illnesses, mainly cancer. In blueberries you can find vitamins A, B, C, E, selenium, zinc, magnesium and iron. You have hardly ever a possibility to gather blueberries on your own, so it’s very important to know how to choose the freshest ones in your grocery store. Always choose smaller and harder berries with smooth surface, they’re the best. Blueberries have a very specific and delicious taste, so it’s a pity to process them by boiling or any other way because they loose a lot of wholesome substances. Enjoy them without any additional sugar. Try fresh blueberry juice! It keeps all the minerals, antioxidants and vitamins and you digest them better than in a raw form. 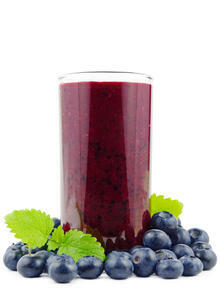 Add blueberries as a complement to your favorite fresh juice recipes, you won’t regret! We intentionally don’t tell you how much blueberries you should add to our recipes. But there is a golden rule, which says: “The more, the better”. Remember to use appropriate juicer. Enjoy the refreshment, which brings you more than just quenching your thirst!